What Mentors Have to Say about Being an Everybody Wins! Mentor. ​“It’s hard to be crotchety with a kid and a book." ​"Everybody should do Everybody Wins. 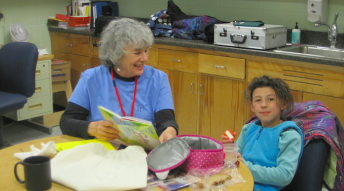 It's a fantastic opportunity to read for pleasure with a student, to form a new and growing bond with a child, to laugh, and to be ordered about by someone only six years old. I love it." ​"Being a part of Everybody Wins has been a wonderful experience. It’s provided me with an opportunity to be part of a young child’s life in a positive way, and it’s given my mentee a chance to do things that he enjoys with a new adult person in his life." ​"As a mentor I have a much better connection to the community; one that I otherwise wouldn't have now that my children are out of the school system. My interactions with the administrators, teachers, and students keep me more informed on many levels. And the time spent with my mentee is rewarding to both of us!" ​"We got to know the library, looking for books that caught our interest and using them to explore subjects like fossils, paper airplanes, mazes and maps. It was a year of discovery for both of us. We used books to learn about the world, share our thoughts and spark ideas for projects. It was fun to get to know one another through our shared interest in reading."